So you want to learn how to get good grades right? Honestly, it’s not really that hard. It depends on how well disciplined you are, and how badly you really want it.It’s easy to want something but it can be a tad difficult to actually get it. But hey, anything worth having is worth working for. I have some tips that will most definitely pave the way for those good grades. As long as you follow them, there’s no reason why you should fail in any class. 1. Study – This one is a given right? Well, I had to put it in here anyway. Apparently there are people out there who think you can still get good grades without studying. Now unless you’re just good like that or take really good notes, then you’ll have to do some type of studying. Set aside a time where you can get the most studying in. Don’t overload yourself though. You could start off at 30 minutes and then work your way up to an hour if need be. I sure as heck didn’t like studying, so I made sure not to overwhelm myself. I took breaks when I needed them, but I made sure that I deserved the break. In other words, don’t sit down and call yourself studying for like 15 minutes and then turn around and claim that you need a break. If that’s the case you’ll be breaking all night and you wouldn’t get anything done. Be reasonable and do the work. No one really likes to study, but if you want those good grades, it must be done. 2. Get Help from Your Instructors – Who else better to go to for help than the people who actually teach you? Your instructors are great sources to go to if you need help with your subjects. They get paid to teach you, so utilize them. You can easily set up a time and date where you and your instructor can sit down and go over anything that’s troubling you. Take the time to get help if you need it. You won’t look silly if you ask for help but you will if you don’t. 3. Join a Tutor Program – If you feel that you’re not getting either enough or the right help from your instructors, then maybe a tutor should be your next step. There are several tutor programs out there like Sylvan, for example, which provide all types of help. Sylvan even has workbooks that you can purchase to help you along your way. You should also be able to find tutors at your school. I used to find that some of the tutors in my school were the actual students who were in my class. So don’t sleep on the tutors. They can be a huge help and what you just may need in order to get those good grades rolling in. 4. Stay off Your Cell Phone – I’m not sure what you were told, but not much studying can be done if you’re always on your cell phone. I know it can be a huge distraction. I understand that communicating with your friends is important, but I doubt they’ll be texting you when they’re accepting their diploma on stage and you’re not. Keep the calls and texting to a minimum. Maybe you could set up a specific time around your studying time for talking to friends. Getting good grades should be your number one priority and you can’t be committed to that if most of your time is consumed by your friends. 5. Spend Less Time With Your Partner – I know how hard it can be to stay away from your boyfriend or girlfriend, but it can help in boosting your grades. Think about it this way. If you spent a little less time with your partner, that would free you up in order to get some studying done. Absence makes the heart grow fonder. Just think about how excited you two will be once you do start seeing one another on the regular. Sometimes you have to make sacrifices in order to get what you want and this would be one of them. I’m not saying abandon your partner, but I am saying that just for a while, you may need to lay low and handle your business. 6. Reduce Your Number of Activities – If you want to know how to get good grades, this is another one of the ways. If you’re currently involved in ten different activities at once, you can imagine how hard it is to get anything done. You need to only carry the amount of weight that you can hold. If you can’t balance studying and 10 activities at once, then something’s gotta go. Cut back on the activities. I mean they’re great to do, but your education comes first. If you have to give up of a few things, then that’s okay. You can always pick them back up. 7. 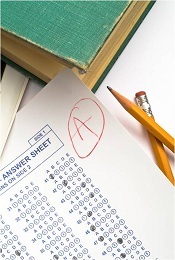 Stay Focused – Staying focused is definitely an important factor in getting good grades. Your mind can’t be going every which a way. It’s easy to get distracted, that’s life. But it’s your job to stay on track. You pretty much have to be a self motivator, which can be hard to do. Set goals for yourself to keep you on track. If you’re currently getting a “C” in your science class, shoot for a “B” by the time report cards come out. As long as you stay focused on your goals, you shouldn’t have any issues. I just gave you 7 tips on how to get good grades. What are you going to do with them?